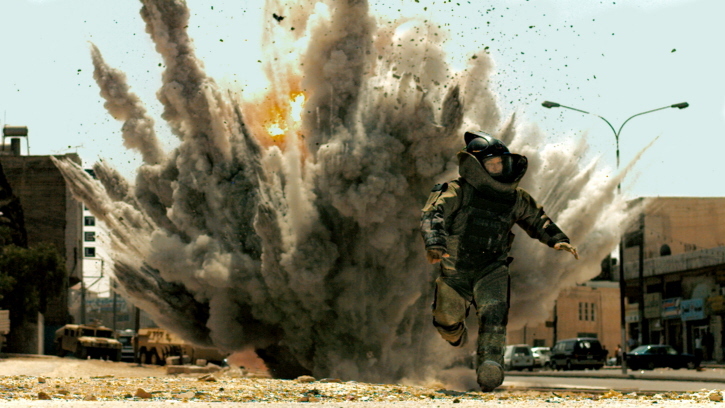 Set in the current Iraq war, after the proclamation of “Mission Accomplished” and the transformation of a battlefield army into an occupation force, The Hurt Locker follows the finals days in the rotation of a bomb disposal unit (the days count down with each mission) as it gets new cowboy team leader, Staff Sergeant William James (Jeremy Renner), a maverick who steps up to a bomb like a gunfighter in an old west showdown, tough and swaggering and on his own terms. James doesn’t follow the rules. Every bomb is a challenge he refuses to back down from, even when the intelligence expert on the three-man team, Sergeant Sanborn (Anthony Mackie), counsels him that he’s vulnerable to snipers. James simply tosses the headset and assumes his teammates will watch his back, scanning the windows and the roofs for any potential gunman, which in a busy urban street surrounded by apartment buildings and open roofs can be myriad. This may be the same sun-bleached Iraq of dusty dirt streets and open deserts we’ve seen in other Iraq war films, but it’s a different kind of movie. Bigelow’s handheld camerawork roams like a spotter’s eyes, always surveying, always getting another look, and the cuts are shifts of perspective that both to keep you off-balance and give a sense of how vigilant they are. The photography by Barry Ackroyd (who shoots with a combination of handheld 16mm film and high-def video) is razor sharp, with an almost unsettling clarity that is both hyper-real and adrenaline-charged. Bigelow shows us the world through their roving eyes without comment, letting us realize for ourselves that this adrenalized alertness is a survival skill. In one stand-out sequence, a desert stop to help a unit of private soldiers (led by guest star Ralph Fiennes) back from a bounty hunt becomes an ambush. It’s the closest the film gets to a classic war movie: they become a team centered by James, who serves as spotter to Sanborn on the precision long-range rifle and gives verbal support to the less-steely Specialist Eldridge (Brian Geraghty) watching their backs. So many war movies get the chaos of battle and the suddenness of death. Bigelow is just as interested in the stillness and the patience. These guys do their jobs, trust one another to do their jobs and stay vigilant, and team leader James, up now seen as just a maverick without rule, shows himself to be an authentic leader and a crack soldier. Bigelow slows everything to their experience: they wait, still and vigilante for any movement, James spotting for marksman Sanborn, breaking only for sustenance (break out the juice boxes, boys) and reloading, until they’re absolutely sure that there is no one else out there waiting to kill them. James drops his field glasses, proclaims “We’re done,” and in a jarring, brilliantly abrupt cut, we’re back on base with the men, too juiced up to come down off the survivalist high. Jeremy Renner is remarkably effective as James, a man of action in the manner of a Howard Hawks hero: he’s defined by what he does and how he does it, not what he says. James is the best at what he does, and when he does it he is in control. More than that, he’s alive, riding the charge of the challenge. The flip side is that he’s not the only one on the line: he puts his team on the line every time he refuses to follow Sanborn’s orders and leave a particularly vulnerable situation. The easy reading is that James can do what he does because he doesn’t allow himself to get emotionally attached: there’s no one else to care about. When he allows himself to get attached to a smart-talking street urchin hawking pirated DVDs just off base, the results are nearly fatal: he makes it personal when he finds the boy’s dead body and leads his team on a rogue mission looking for payback, tossing every hard-earned survival skill out the window and letting his emotions overwhelm his brain. The grim punchline isn’t the injury to the support team that has survived his antics on the job only to get crippled in a stupid vigilante stunt. It’s that the boy isn’t dead after all and James, rather than finding solace when he finds him alive, merely re-applies his emotional armor even tighter. He’s not about to let another emotional attachment get to him again. There’s no political message here, nobody questioning their mission or arguing policy. These are just men doing their jobs in an unforgiving workplace, and Bigelow, more than anything, is interested in how they do it, because the how is the difference between going home at the end of the rotation in one piece or not. The problem for James is how to unplug. A quote by Chris Hedges opens the film: “â€¦ war is a drug.” And sure, we see the rush of danger and the adrenaline high of combat, but by the end of the film the phrase takes on new, more troubling meaning. Home from his rotation, James is lost, unsettled, uncommunicative. He’s been trained to kill and to survive and to do the most dangerous job on Earthâ€”disarm bombsâ€”and the army has not seen fit to retrain him for civilian life. The decision to return and the journey back is told in a few brief, almost abstracted shots that sweep us into his unstoppable march back to the front, cut together with a hard efficiency. The startling abruptness of each edit communicates the power of his desire to get back and the single-mindedness of purpose. From the lazy wandering and alienated boredom of James pushing a shopping cart through a warehouse of a supermarket, seen in the half-light reflection of glass refrigeration doors like a phantom of the man we saw thrive under pressure, Bigelow jumps us into the window seat of a troop transport, riding the momentum and echoing the reflection but now driven with a destination, and perhaps a desperation. That momentum carries us through the next couple of cuts, each one propelling James along this singular vectorâ€”the direction doesn’t change, only the locations glimpsed in the background of these weirdly disconnected images of the soldier riding and flying and marching back to the frontâ€”with ever more force and purpose, until he’s back in the world he understands. Only when he’s once again wrapped in the blast suit, striding down another dusty street to face off against an unexploded bomb, does the swagger and confidence, the personality that dissolved stateside, return to James. Becoming the best comes at a cost and he bears the brunt of it, until he gives in to the drug once again and marches back to the one place he feels alive. Or at least in control. Or the illusion of control. James is like a gambler who’s in it for the thrill rather than the money. Even with the odds in his favor, he’s going to lose if he plays enough hands, and he shows no signs of folding. The way you don't die.